This is part 2. Part 1 is about story in video games in general. I have split this post in two, but could have just as easily filled the pages of a book. Incidentally, there are already many excellent books about storytelling out there. Part 2 focuses on the story in Torgar’s Quest. Basically, Torgar’s Quest is about a dwarf running through a dungeon, killing and destroying things along the way, while looking for treasure. That is where I started, and while the game mechanics were fun, the game needed story to better tie the elements together. Some background and motivation for the game’s main character seemed like a good place to start. In this case, a reason for Torgar Splitbeard to be in the dungeon, and a goal the player can help him achieve. Early on, I had decided that to win the game, you would need to find and collect 7 crystals. It was an easy jump from there, to say that these were actually shards that together form a powerful artifact – The Mastery Crystal, which Torgar of course is seeking to find. Brainstorming is your friend when developing story, and much of what came next was a product of exploring this initial idea. Seeking to boost Torgar’s motivation, I decided that he was the underdog of his clan, a younger prince with no hope of inheriting power, and everyone in his family saw him as weak, and incapable of achieving greatness. Here I had my first glimpse of Torgar’s personality: clearly upset, with a strong need to prove himself to his clan, and more so, to become powerful in his own right. Whenever I am stuck in developing a story, I start asking questions. Why is this character interested in X? How did Y learn about Z? What if something unexpected happened? By asking questions, I soon had a tie-in between the crystal artifact and Torgar’s own story. Why was the artifact split into shards? What if the Mastery Crystal was too powerful, and hunting for it could corrupt Torgar’s very soul? I liked that, so in the game, the longer you take to find the seven shards, the more twisted Torgar becomes. I also started wondering about the dungeon itself, and decided it had once been the home of Torgar’s clan, but that the dwarves had been driven out during an invasion of monsters many years ago. This adds to Torgar’s resolve: he is not only seeking a magical crystal, he is also taking back his clan’s old home. Tying story strings together is never a bad thing. 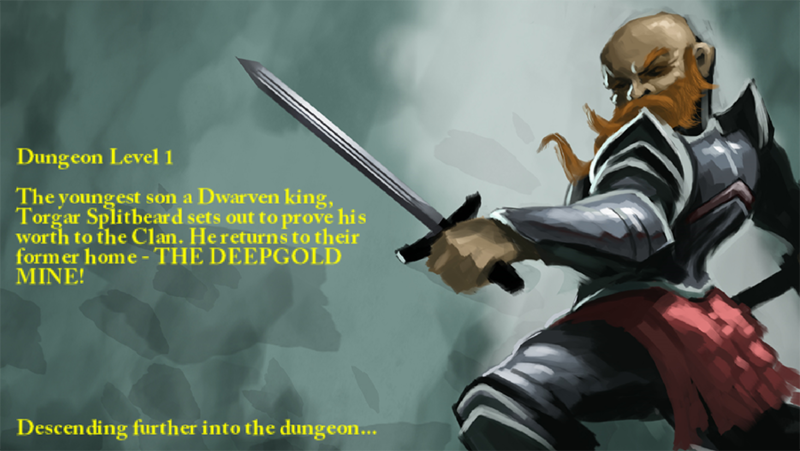 I included bits of lore to spice up the Deepgold Mines, which can be found in hidden tomes around the dungeon. These books of lore serve no other purpose than to add flavor, a dash of humor and to make the game more fun. But if you’re the kind of person who tends to skip the flavor text, you can simply ignore it and play the game with no penalty – an important detail, because I definitely did not want to force players to stop and read, if all they want is to bash monsters (Diablo handles this by using a voice over that plays in the background, but that was a little out of my budget). No matter the size and budget of your game, carefully consider its story and how you can get the most out of it. I strongly recommend reading up on story structure and narrative methods. Coming from a game-perspective, also read about how stories are told and characters are developed in film and novels, which will help you find and develop your own universes full of exciting stories. You may also enjoy reading about storytelling in marketing, and learn more about stirring emotion and excitement in the people who play your game. Story is a huge topic, and there is no way to cover it all in a single blog post. I have split this post in two, but could have just as easily filled the pages of a book. Incidentally, there are already many excellent books about storytelling out there. In part 1, I talk about story in the context of video games. On a basic level, stories are the context that tie events and characters together to give them meaning. Through them, we pass on wisdom, tell jokes and share experiences. A story can be simple or complex, and have a lasting impact on its audience regardless. For any story to work, it has to make sense in the context of its universe. In this case, universe refers to the lore and background story as well as the laws enforced by the physics engine of your game; or rather the sum of all those parts. Create any universe you want, but once it is there, you have to commit to its laws. Depth and detail must then be balanced with the circumstances under which the story is told, and in games, this means fitting the story to match the pace and feel of the game you want to end up with. Simple games typically require less complexity. For example, you won’t find much story in Candy Crush compared to World of Warcraft. Story helps players learn advanced features and in-game strategies, but can also get in the way of the action under less complex circumstances. Note that both games have strong fan bases and hold many hours of game play, and story is not the only deciding factor for a game’s success. Carefully crafted story greatly enhances the emotional response from the player. Twists and surprises, humor or clever dialog, combined with timing makes your game more memorable, more fun and more likely to be played a second time. When you test your game, try to gauge whether you get the response you were hoping for and if not, tweak the story or the way it is delivered. Often, action is centered around characters the player can root for. We want our Sims to fulfill their dreams. We want the rightfully angry birds to take down the greedy pigs. We want Lara Croft to make it through whatever temple she’s exploring today. We want to win! Sometimes a good setting can evoke an emotional response from the player as well, much like a character. You can tell the story in a number of ways, from cut scenes to audio clips or text dialog boxes and in-game choices, leading to different outcomes. Or any combination of these. You can even make it part of your level design. The trick is to choose the method of delivery that works best for your game. Is it okay to break up the action, or should it play out in the background? Does it simply set the stage or force players to make decisions? It is worth noting that game-based stories often unfold through programmed behavior, rather than a pre-written narrative. For example, Creepers provide fodder for many a Minecraft story, and though each player has experienced Creeper encounters their own way, the damage they do is something all players can relate to. Still, Creepers never speak a word. It is purely their behavior and design that fuels the story here. This is something to be mindful of when designing AI and other behaviors. From a marketing perspective, story is meat on the bones of the basic features and game mechanics. When describing the game to others, story gives people a way to quickly put all those features into a bigger picture, and if you tell it right, make them curious for more. Avoid obstacles on-screen while traversing from A to B is less fun-sounding than help the frog avoid traffic, and safely cross the road. A great character can really help boost your game’s fan base. Continuing the Minecraft example, in spite of its lack of dialogue, Creepers are prominently featured on toys and clothes everywhere Minecraft gear is sold. I am personally the proud owner of a Creeper T-shirt, a desk vinyl toy, Legos and more. You don’t have to be hugely successful to promote your game using characters, you just need to know which characters will appeal to players in-game (again, this is something you can test), and then use those characters as hooks to spark even more interest. As someone who enjoys reading video game post mortems, I thought the time had come to share a bit about one of my own games. Let’s begin with some stats. Diner Match is my third game for mobile, and so far also the most downloaded of the three. Currently, that means around 400 downloads in just under a month. Not exactly staggering numbers, but still, it’s around what I expected. This was always a micro production, it’s free, and the only income I get from it, comes from players clicking on ads. Last I checked, I had made almost $0.50. Obviously, if I was in it for the money, I would have failed miserably. Currently the game is out for iOS. An Android version is coming, eventually. I am happy. Did I mention, it’s my most downloaded game? No matter what the actual numbers are, that’s awesome! I check the Game Center leaderboard from time to time, to see what scores are needed now, to get into the top 20 or top 10. Seeing names climb up the list, tells me there are players who are addicted to the game, and that’s just about the best news possible. Because it means that game is fun! 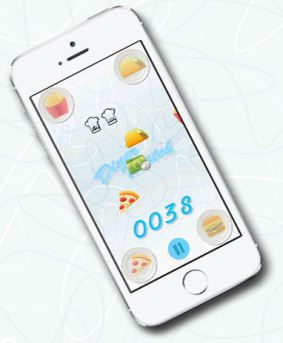 In Diner Match, the goal is to swipe food items onto the right plates, before the food slides off screen. If you miss, or make a wrong match, you lose a life. Occasionally, a bonus “tip” appears, which you can tap for extra points. The whole thing gets faster as you go, until you can no longer keep up. When your 3 lives are up, the game ends. So, Diner Match is a success because it’s fun and at least mildly addictive. Why then, was I expecting relatively low numbers? 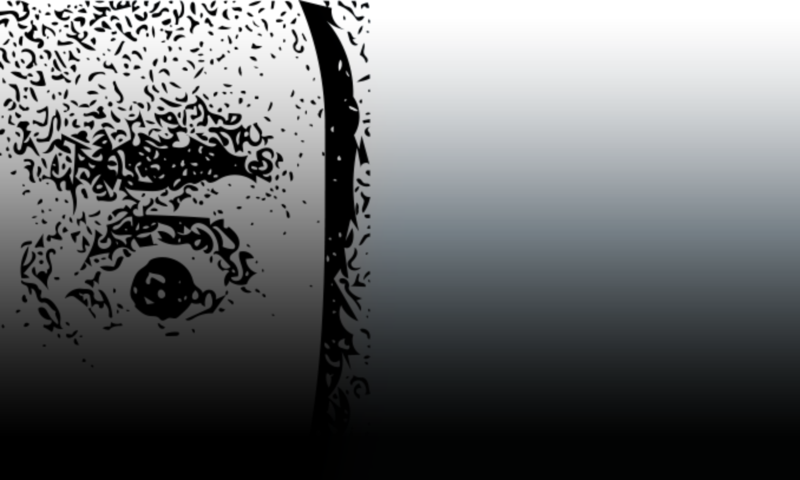 For one, I’m not great at promoting my games, getting it out there on all the cool websites, and so on. I tweet about it, I post about it, but if you are not already following me, chances are you won’t hear about anything I create. Most often, I hide behind the excuse of not having enough time, and while I do have a full time job as well, I still find time to both play and make games, so it’s not really much of an excuse. Let’s say, it’s a great argument for working with a team of diverse skill sets. Diner Match is a based on an extremely simple game mechanic: match the food item with the correct plate. It’s essentially the same as the classic match-the-square-peg-with-the-square-hole game, that’s been dominating the toddler segment for generations. In my case, I was more directly inspired by my friend Joel Telling, who was making Orange Banana (available for iOS and Android). It’s similar in the sense, that you have to match two things, but in a way they are also opposites. In Diner Match you’re trying to stay alive, as long as possible, whereas in Orange Banana, your goal is to finish matching the fruit as quickly as possible. I love Joel’s concept of a game you are trying to end, as fast as you can, and I think he described the difference between the two games best, calling Orange Banana a sprint and Diner Match a marathon. For the record, a “marathon” in this case typically takes a couple of minutes to finish. As I was working on Diner Match, I had several conversations with Joel. These were a huge motivation for taking the game past prototype stage, and making it public. The Diner theme came through conversation with my wife, Kelly. She calls herself a foodpornographer, so it’s no surprise we ended up there. Actual production was very fast. The game came together in just a few days. Much of what you see in the game, is made with stock assets. Since I was planning on giving the game away, I had a limited budget. Altogether, the assets costs me around $50 to license (so, with the current income of $0.50, that leaves me $49.50 in the red – not really worth crying about either way). Finding art that went together with both the theme, and the overall feel, took as long as constructing and balancing the game mechanics. I made the sounds myself, using the excellent Bfxr tool. Altogether, Diner Match took about a week and a half to make. Not counting the 9 days it took for it to be approved for sale in he App Store. Diner Match started as a small side project, and ended up as probably the most polished looking game, I have put out. My expectations were low, but I did not let that be an excuse for half-assing the design, and in the end, these are the reasons Diner Match is a success story.